According to the latest statistics from Decision Lab, Vietnam’s love for local restaurants remained unswayed despite rising competition from newly imported Korean, Japanese, and Western cuisines. 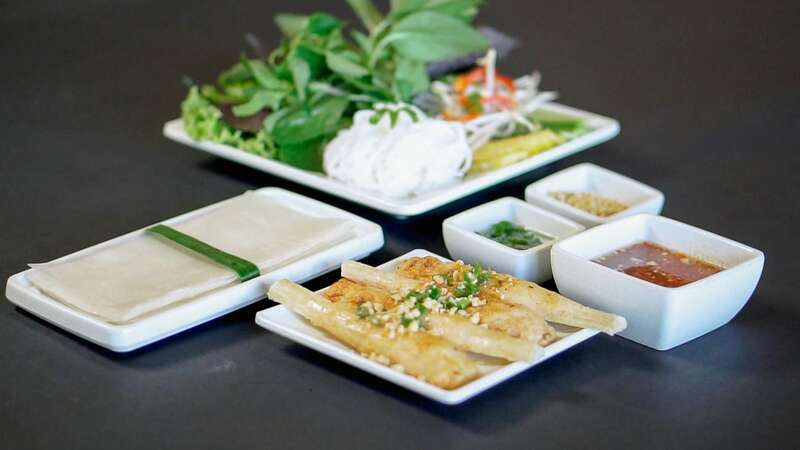 In fact, Vietnamese cuisine attracted 80% of all diners in 2018. This trend is highlighted in the consistent expansion of Vietnamese restaurant chains like Wrap & Roll. 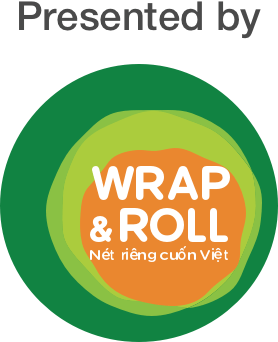 Created to celebrate Vietnamese rolls, Wrap & Roll have been welcoming customers for 12 years at their 15 locations in Hanoi, Ho Chi Minh City, Singapore, and China. 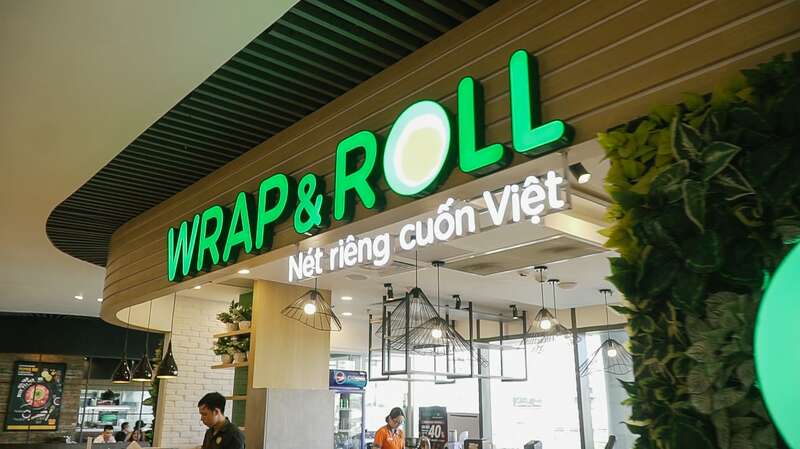 They recently opened a new franchise on the 3rd level of Estella Place Shopping Center in District 2 delighting roll-lovers in Saigon’s trendiest residential area. The opening of Wrap & Roll at the Estella Place Shopping Center expands upon the chain’s fifteen locations. On our way to explore Vietnamese cuisine beyond pho, we meet with Wrap & Roll Estella Place’s chef Phuong to learn her secrets to the perfect rolls. 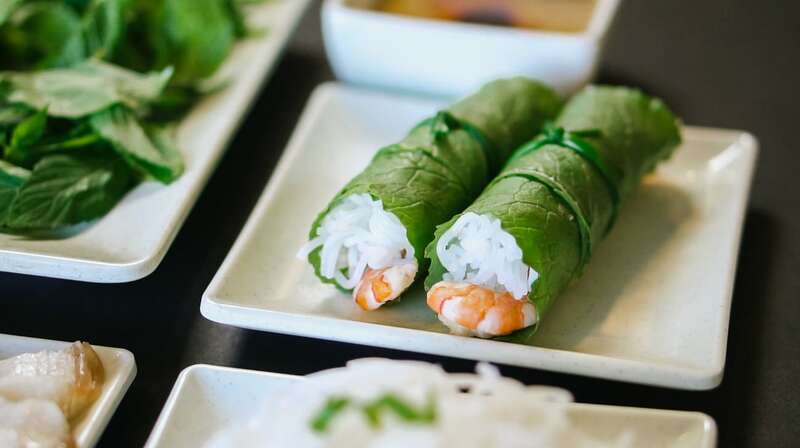 Today’s menu includes cuon diep tom thit (mustard lettuce rolls with prawns and pork), chao tom nuong mia (grilled fresh prawn on sugarcane), and banh cuon nhan thit (steamed rice rolls with minced pork and mushroom). We also reveal a new dish, recently added to the Wrap & Roll menu to celebrate the Tet holiday. Rolled in delicate lettuce leaves, cuon diep tom thit requires careful rolling. According to Phuong, this dish used to be served to the King’s family, so the lettuce needs to be prepared carefully. Ideally, the leaves are of the right size, fresh and intact. The other ingredients such as prawns, pork and herbs should also be fresh and remain unseasoned so as to keep their original flavors. The secret to these rolls is the dipping sauce. Prepared with stewed liver, pork and fermented beans, this sauce tastes like no other. You can add spicy satay to suit your own taste. Lay the lettuce flat on a dish, remove the bitter leafstalk with a knife. Fold the two ends of the lettuce together. Add herbs on top. Add prawns, pork and bun noodles onto the lettuce. Gently roll the lettuce over the mixture. Tie a scallion around the roll to secure it. Dip the roll into the sauce and have a bite. Chao tom nuong mia features grilled shrimp meat suffused with the sweet liquid of sugarcane. Also an imperial dish once served in Hue, chao tom nuong mia is not as popular as cuon diep tom thit because of its tricky preparation. ‘Chao tom’ refers to the light-seasoned ground prawn wrapped around a sugarcane stick. The ground prawn batter needs to be consistent enough so it won’t fall apart during the grilling, yet tender enough to bite. Temperature plays a key role in the consistency of the batter. Though, cold is preferred. When on the grill, the sweetness of the sugarcane melts into the prawn mixture wrapped around it. The wrapping technique is the dealbreaker to the success of chao tom. Put a bit of cooking oil in the palms of your hands. Spread prawn batter on one hand, place a sugarcane stick into the middle of it using the other hand. Wrap the batter around the stick. Stroke gently on the surface to secure it. Prepare the chao tom in a steamer for five minutes. Grill the chao tom for five to seven minutes until it turns golden brown. Spread onion oil on chao tom as you flip it. Cut chao tom into halves. Plate it with onion oil and peanut toppings. Enjoy chao tom with rice papers, herbs and fish sauce. Though preparing the steamed rice paper for banh cuon is difficult, the end result makes it worthwhile. Banh cuon is a type of steamed rice roll, with or without stuffings. 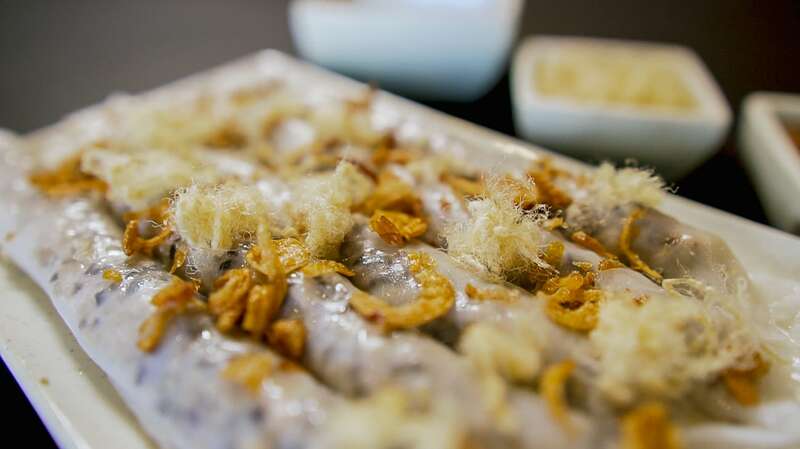 Banh cuon is so popular that every region in Vietnam has their own version of it. Despite the variations, they have one thing in common: the rice shell is the most important part of the dish. At Wrap & Roll, the shell batter consists of freshly ground rice powder and a variety of complementary powders. The result of this recipe is a shell that’s soft and melty, yet consistent. Banh cuon shells are cooked in a special type of steamer. Spread a scoop of shell batter evenly on the steamer top. Cover it with a lid and wait for it to cook for 30 seconds. Spread cooking oil on a round flat tray. Put a stick under the shell, gently lift it to take the cooked shell out of the steamer to the tray. Add minced pork and mushroom into the center of the shell. Roll it over. Plate the rolls next to each other. Cut the rolls into three equal parts, top with pork floss and dried onions. Serve the rolls with fish sauce. 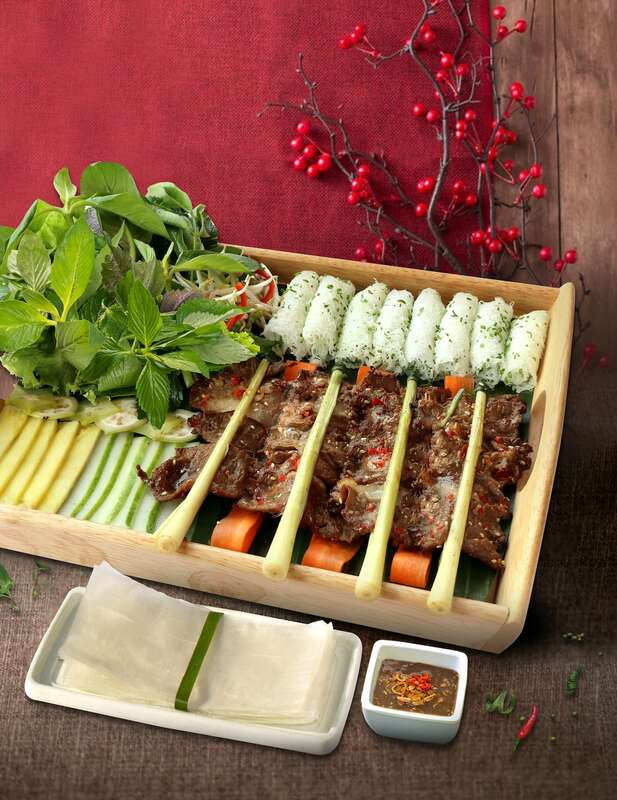 Wrap & Roll decided to make this Tet special by rolling out a new dish called Bo nuong banh hoi, which is sliced beef skewered with lemongrass served with vermicelli rice cakes. 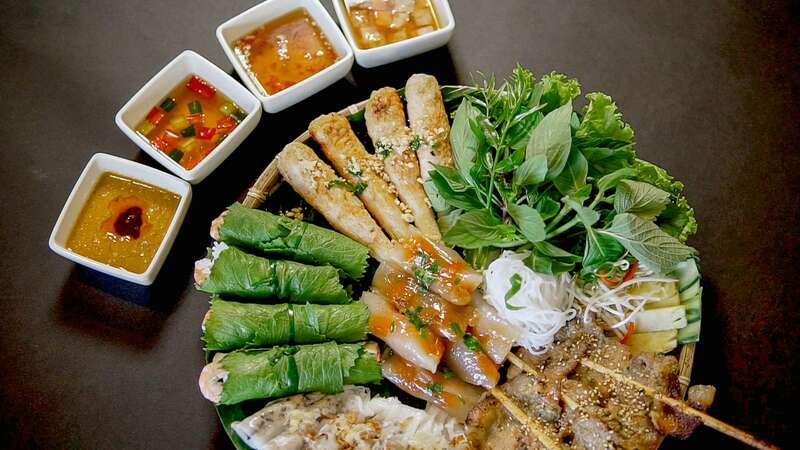 Bo nuong banh hoi highlights authentic Southern Vietnamese flavors. When grilled, the meat soaks up flavor from the lemongrass, adding to it a citrusy punch and a distinct aroma. The grilled beef is enjoyed with rice cakes and a variety of raw vegetables such as banana flowers and star fruits. If you’re a fan of fish sauce, you’ll love its cousin, mam nem, which typically goes with this dish. Bo nuong banh hoi is popular among Southern Vietnamese and is sure to give you a taste of authentic local cuisine.